News on developments on Celiac Disease research and articles from members and other chapters on living with Celiac Disease and Gluten Sensitivity. Celiac Kids Camp 2019 – July 8-12, 2019. 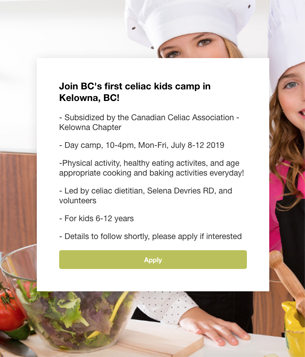 Join BC’s first celiac kids camp in Kelowna! -Physical activity, healthy eating activities, and age appropriate cooking and baking activities everyday! Sign up to be kept in the loop! Registration for the camp should go live in about 1-2 weeks. We are just trying to finalize a few things for pricing, depending if we can get some additional sponsorship, but you can expect it to be in 200-300 dollar ballpark range. Lunch and one snack per day will be provided for the kids. • The kitchen is not a certified gluten free kitchen. However, it will be sanitized top to bottom before the camp starts and it will remain gluten free for the entire week of the camp. • Dedicated GF equipment will be used: cutting boards, wooden spoons, baking pans, baking/cooking utensils, baking equipment (ie-mixers), food processor, blender, pasta strainer, toaster. • Questions? Happy to answer them, please contact me. • Food donations are only accepted from dedicated bakeries, or GF companies that state GF on packaging, are certified by CCA or other organization, or have been vetted by me. At this time, no additional medical diagnosis can be accommodated. If camp celiac is a success, we do hope that we will be able to manage type 1 diabetes in the future when we have a larger budget to accommodate additional health professionals. Dairy free will be accommodated for dairy sensitivities. If there are dairy allergies, please note that there will be dairy in the facility and there will be no guarantee of preventing cross contamination of dairy in the kitchen. No other food sensitivity or any allergies can be accommodated at this time. Staff will note additional sensitivities upon registration, but the offending food/s may or may not be used in the kitchen. If they are in the kitchen, staff will direct your child way from the food. Therefore, if it is a life threatening allergy or anaphylactic response, it is recommended that your child does not participate in the camp this summer. The schedule will be worked out closer to the date. But, you can expect that your child will participate in one age appropriate cooking or baking activity per day and engage in physical activity, and arts and crafts daily as well! If you have not already applied for the celiac camp, please do so by clicking here as I will be emailing everyone once the registration link goes live. New Canada’s Food Guide: What does this mean if you’re gluten-free? January 23, 2019 – Mississauga, ON. Health Canada released its new Food Guide recently with some key updates. The content was created using the most up to date and evidence-based research. In this food guide, there is a renewed focus on plant-based foods, lower intakes of processed foods which contain higher levels of sugar, saturated fat and sodium with a less direct emphasis on dairy products as the dairy and meat categories were combined into one group labeled protein. The Food Guide also has a guiding statement that if Canadians have a specific health condition, such as celiac disease then they should consult further with a dietitian for their specific nutritional requirements. So, what does this mean for Canadians required to eat a gluten-free diet? One of the first considerations includes the differences in folate fortification of gluten-free grains and processed grains which can result in lower folate intakes of children and adults with CD (1). While folate fortification of gluten-containing flours is mandatory in Canada, folate fortification of gluten-free flours and processed grains is voluntary in Canada. This places Canadians consuming the GFD at risk for suboptimal folate intake(1). While the increasing emphasis of plant sources of protein (such as lentils, beans) and fruits and vegetable may be potentially beneficial to increasing folate intake in Canadians on the GFD, it will be challenging for children and woman of child-bearing potential with CD to eat sufficient quantities of these foods to meet their folate needs. Suboptimal folate status has important growth and developmental implications for both the child and woman of child-bearing potential and hence needs to be addressed when developing nutrition guidelines for Canadians with CD. Consultation with a registered dietitian regarding the need for routine folate supplementation is an important consideration for Canadians with CD and highlights the need for consideration of a folate fortification policy for gluten-free grains in Canada. Development of evidenced-based nutrition guidelines for Canadians with CD will also be important in this process. Another nutrient of concern for children with CD is vitamin D, which is predominantly found in fatty fish, vitamin D fortified cow’s milk and fortified margarine. Vitamin D is an important nutrient for bone health, particularly at time of CD diagnosis due to the potential for malabsorption of vitamin D related to gastrointestinal damage caused by gluten exposure. This is particularly important for children and youth as peak bone mass is achieved in adolescence and early adulthood. Vitamin D can also be obtained by exposure to sunlight as the sun stimulates the skin to produce and synthesize vitamin D. However, as Canadians have reduced sunlight exposure due to our long winters, suboptimal vitamin D status can occur throughout the year if Canadians do not consume sufficient quantities of vitamin D-fortified foods. As a Canadian with CD, it will be important to eat and drink sufficient quantities of vitamin D-rich foods and to consider the need for routine supplementation during the long winter months. Choosing lower fat, dairy choices that are fortified with vitamin D will also be important for Canadians with CD to ensure they meet their vitamin D needs. Lastly, the final consideration of the new guidelines regarding lowering your intakes of saturated fat and added sugars is an important message for Canadians. It is noteworthy to highlight that Health Canada is placing a stronger and more direct message regarding this point. Increasing intakes of fruits and vegetables and lower fat dairy and meat and alternatives (protein choices) as a healthy way to accomplish this is being emphasized in the new guide. However, for the child and adult with CD this can be challenging since many of the processed GF-grain products are a lot higher in saturated fat and added sugars. A recent Canadian study by Elliot et al(2), has shown that gluten-free foods marketed to children were higher in added fats and sugars. This is particularly concerning for children and adults with CD as this may increase the risk for obesity and chronic diseases and thus highlights the need for nutrition guidelines to emphasize ways for Canadians with CD on the gluten-free diet to address this concern. One of the ways is for specific evidenced-based nutrition guidelines focused on the GFD to be developed. This is currently being done by a team led by Dr. Diana Mager Ph.D. RD at the University of Alberta. Currently, Dr. Mager and her team are developing a GF food guide for children and youth with CD and hope to extend this work in the future by developing a GF food guide for adults. This endeavor is important because specific consideration of the nutritional challenges associated with eating a gluten-free diet is being addressed in these guidelines. This work has been supported by a Canadian Celiac Association J.A Campbell Research Award and with help from the Edmonton and Calgary Chapters of the Canadian Celiac Association. 1. Alzaben AS, Turner J, Shirton L, Samuel TM, Persad R, Mager D. Assessing Nutritional Quality and Adherence to the Gluten-free Diet in Children and Adolescents with Celiac Disease. Can J Diet Pract Res. 2015 Jun;76(2):56-63. 2. Elliott C. The Nutritional Quality of Gluten-Free Products for Children. Pediatrics. 2018 Aug;142(2). There are many myths about flours and a lot of discussion regarding arsenic in flour. The glutenfreewatchdog.org provides credible information regarding this. The bottom line is that you should not base your diet on rice, especially brown rice which has more arsenic. Alternate your grains so that you get a variety of grains in your diet. Soy – There is a theoretical concern regarding hormones and soy. Again variety is important so you do not overload on any one grain. Soy in itself is not harmful. Oats – Newly diagnosed should wait up to 18 months when the tTG normalizes to include gluten-free oats in the diet. The gluten-free certified oats should be introduced slowly due to the increase in fibre in the diet. The Health Canada website provides good information on gluten-free oats. What information should I give my doctor when first diagnosed? Direct the doctor to www.celiac.ca and give them handouts of position papers that are available there. tTG follow-up is helpful but not 100% accurate as to what is going on. The Celiac Follow Up Care Resource brochure will assist the doctor in what testing should be done on an on-going basis to manage celiac disease. Panel members stated that dietitians and dentists are very helpful in diagnosing celiac disease (CD). What percentage of the general population are affected by celiac disease? Canada borrows the data from the US which indicates approximately 1% of the population has CD. Test for CD before testing for anything else Canada is developing a registry for Registered Dietitians for CD. Training for undergrads is also a priority. Handouts are on the national website that Dietitians can download. How long does one have to eat gluten before testing? There are many different answers quoted to patients. Generally, 4-6 weeks of a slice of bread per day is adequate. If a patient has been gluten-free for a long time, more time on gluten may be required. What symptoms affect the brain/body when eating gluten? Symptoms vary from person to person. You must always beware that the cause “might be something else”. The longer an individual is off of gluten, usually the more sensitive they are to gluten exposure. Please comment on tTG remaining high for an abnormally long time? It takes different people different times to come within the normal tTG range. The number one reason for not normalizing is they are unaware of gluten exposure. Refractory celiac disease is rare. This is when the individual does not respond to a gluten-free diet. Best to do your research before you go. Find out what the food safety standards are in the country that you are going to and it is often useful to contact the local Celiac Association and check out their website. The inclusion of wheat starch in food is allowed in Europe. In Canada, today, this does not meet our standards. Additional processing is required to remove the gluten. Canadian law requires that anything that contains a gluten source is not allowed. If a mother is celiac, there are no known adverse effects to the baby, however, the fertility of the mother may be an issue in those with undiagnosed celiac disease. Current research indicates that gluten should be introduced to babies’ diets at approximately 6 months of age. Is it possible to have elevated tTG and not be celiac? Yes, there are other conditions that may cause an elevation. It is important that the biopsy provides 4-5 samples to ensure proper diagnosis. How long does gluten stay in your system? Gluten is found in the stool for approximately 24 hours and in the urine for 6 hours.